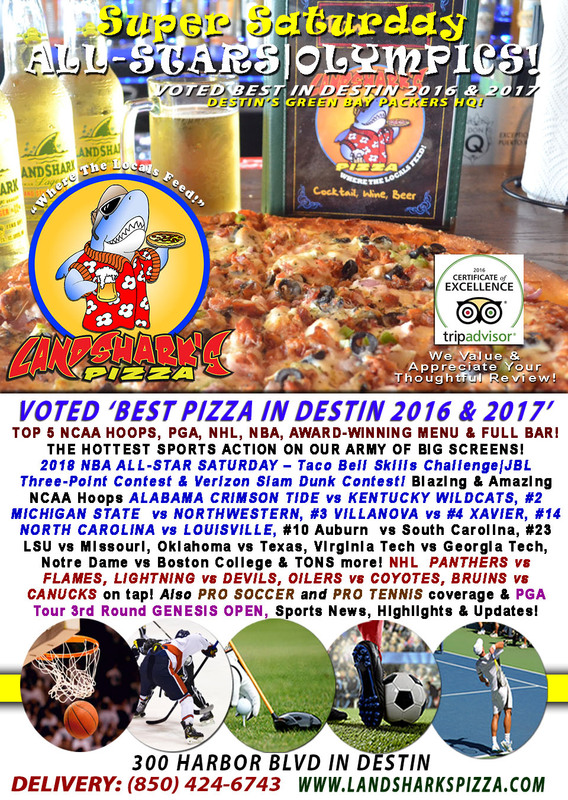 / Best Calzone in Destin FL / NBA ALL-STAR & WINTER OLYMPICS FREEDOM FRIDAY TWO-TOPPING CALZONE & Brew $9.99 – NCAA|NHL & PGA! 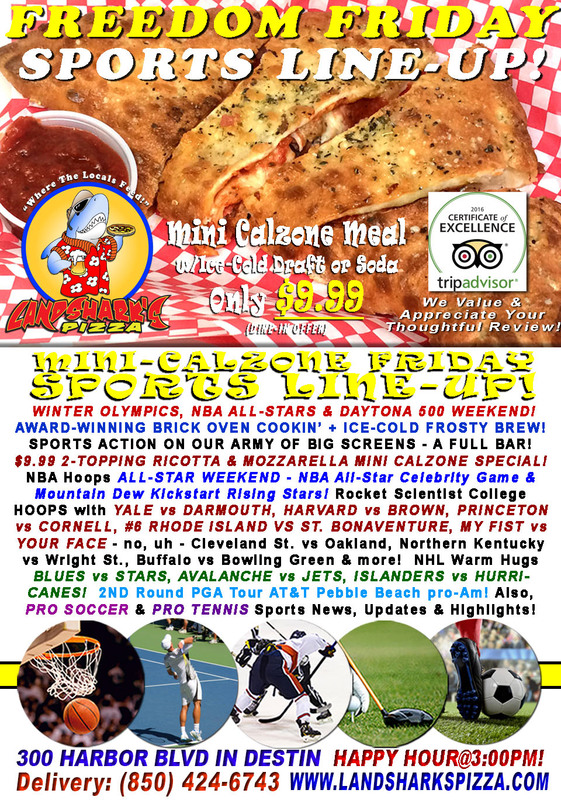 NBA ALL-STAR & WINTER OLYMPICS FREEDOM FRIDAY TWO-TOPPING CALZONE & Brew $9.99 – NCAA|NHL & PGA! 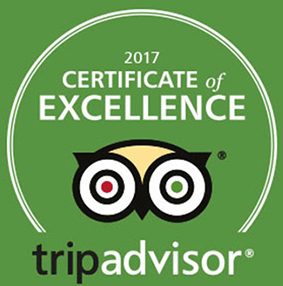 An awesome weekend kicks off the right way with NBA ALL-STAR WEEKEND and more along with a 2-TOPPING RICOTTA & MOZZARELLA MONSTER MINI-CALZONE with an ICE COLD DRAFT or Soft Drink only $9.99 dine-in special to go with great sports on an army of big screens and a full bar! NO DELIVERY TONIGHT thanks to our amazing, big-hearted Delivery Guy who makes all the sacrifices and carries the whole team on his back – gonna be helping out with the ALL-SPORTS ASSOCIATION Charity events helping local youth. That guy is something special. We probably shouldn’t let him do the marketing, though. CALL FOR PICK-UP: (850)424-6743 – do it for the kids, man! For the KIDS! 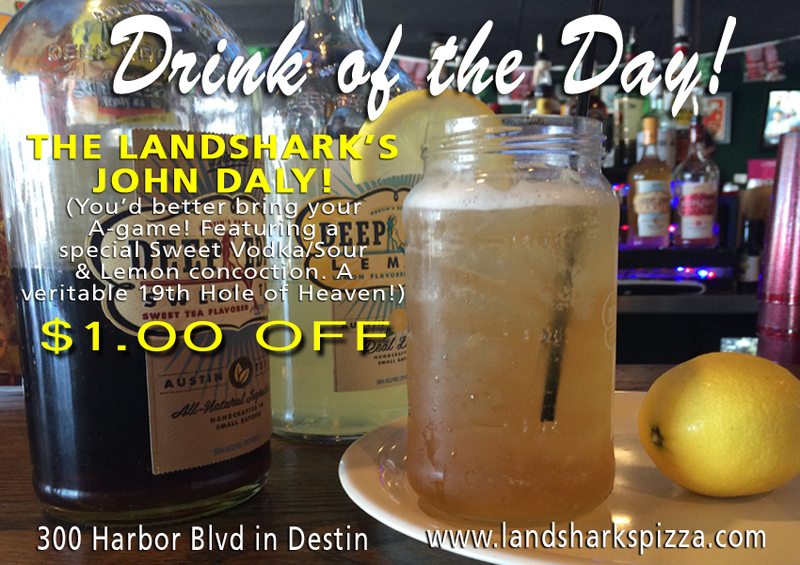 LANDSHARK’S DRINK OF THE DAY – $1.00 OFF our delicious ‘JOHN DALY’ Cocktail. Tee one of these up and take a swig…I mean, swing – FOOOOORE! SPORTS ON OUR ARMY OF BIG SCREENS – NBA ALL-STAR WEEKEND – NBA All-Star Celebrity Game & Mountain Dew Kickstart Rising Stars! 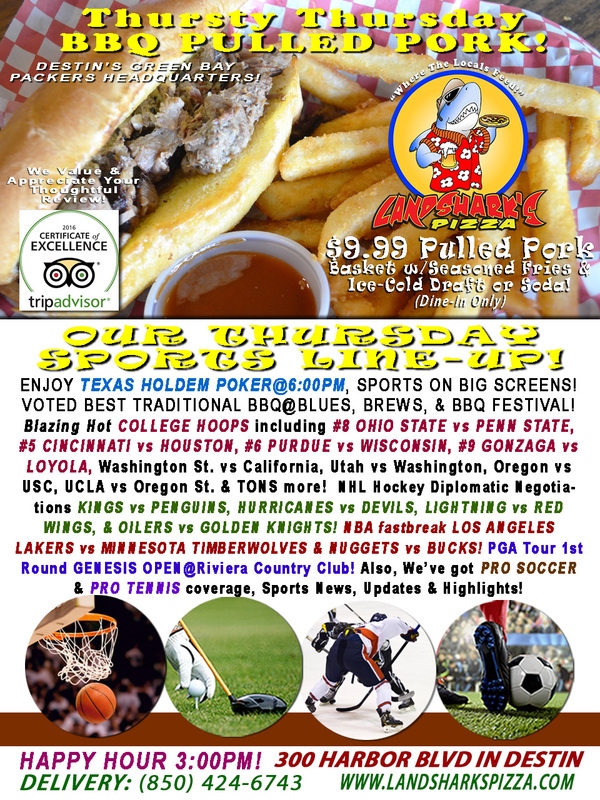 Rocket Scientist College HOOPS with YALE vs DARMOUTH, HARVARD vs BROWN, PRINCETON vs CORNELL, #6 RHODE ISLAND VS ST. BONAVENTURE, MY FIST vs YOUR FACE – no, uh – Cleveland St. vs Oakland, Northern Kentucky vs Wright St., Buffalo vs Bowling Green & more! NHL Warm Hugs BLUES vs STARS, AVALANCHE vs JETS, ISLANDERS vs HURRICANES on tap! 2nd Round Excitement PGA Tour Genesis Open@Riviera Country Club! Also, PRO SOCCER & PRO TENNIS coverage plus plenty of other Sports Broadcasts, Sporting News, Analysis, and Commentary! NBA This Weekend: (Saturday) All-Star Saturday Night – Taco Bell Skills Challenge|JBL Three-Point Contest & Verizon Slam Dunk Contest! (Sunday) NBA G League International Challenge & 67th NBA All-Star Game! NASCAR This Week: DAYTONA 500 (Sunday Feb 18th)! 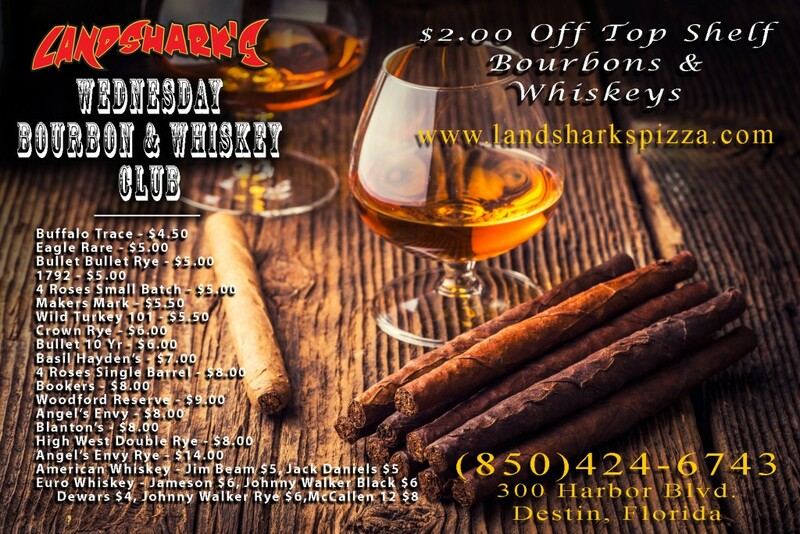 Previous Post: « Landshark’s POKER NIGHT! OHIO ST. vs PENN ST. NCAA Action-Fest! 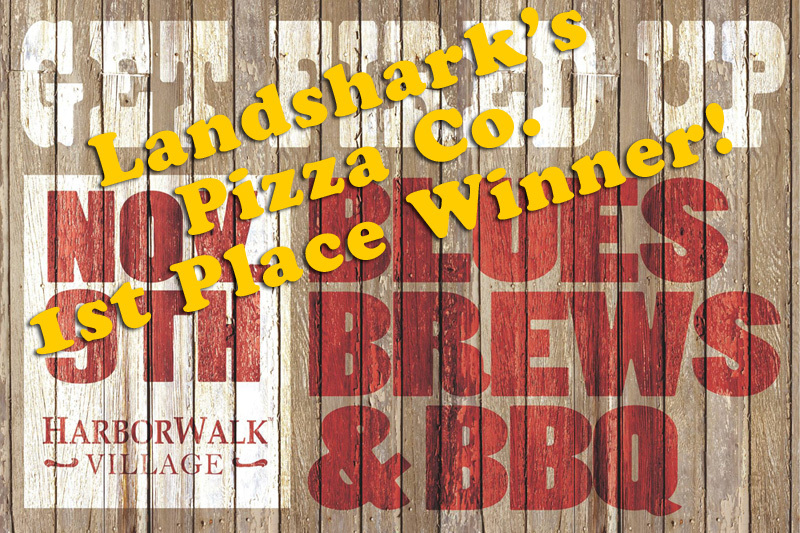 BEST BBQ in Destin & Brew $9.99|TEXAS HOLD’EM FUN 6PM!